Noida is a north Indian city located in the Gautam Budh Nagar district of the Uttar Pradesh state. It is a systematically planned city under the management of New Okhla Industrial Development Authority. Noida is home to several private and government colleges which impart quality education in the engineering field. There are a wide range of specializations are offered by engineering colleges in this city. The literacy rate in this city is 86.53% (as per the census 2011). 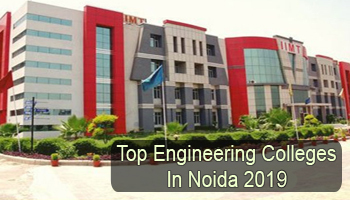 Here we have provided a list of Top Engineering Colleges in Noida 2019. At Sarvgyan.com, we have created a list of top engineering colleges in Noida for the session 2019-20. In this list, we have included the top engineering government and private colleges situated in Noida city. There are various engineering colleges and institutions are located in this city. We have rated the colleges on the basis of several factors like quality education, affiliation and approval, national importance, infrastructure and facilities provided by colleges, student’s preferences, etc. Admission in the UG engineering course (B.Tech) will be done through UPSEE (UP State Entrance Examination). UPSEE is a state level examination organized by the AKTU for admission in various UG & PG courses. JEE Main scores will also be considered for providing admission in B.Tech courses. If students are seeking admission in M.Tech courses they can apply through GATE examination. In Noida, many specializations of engineering courses are trending among the students. Some top specializations are Computer Science & Engineering, Civil Engineering, Mechanical Engineering, Aeronautical Engineering, Electronics & Communication Engineering, Electrical Engineering, etc. If you have any other queries about Top Engineering Colleges in Noida 2019, you can leave your queries below in the comment box. Want to know about best college..?